Jim Parsons and Todd Spiewak To Marry Soon??? According to some online articles, the ‘The Big Bang Theory’ actor,Jim Parsons is gay and that after his acceptance speech for the Outstanding Lead Actor in a Comedy Series Award he received in the Emmys for TV 2010, he proposed to his boyfriend, art director Todd Spiewak who instantly said 'yes'. 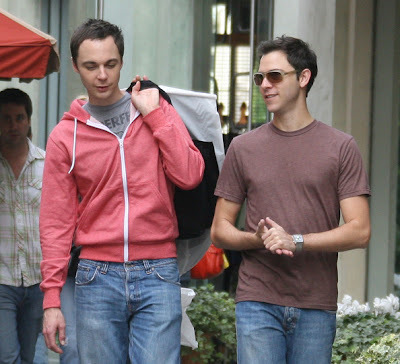 Jim Parsons and Todd Spiewak reportedly have been together for three years and have been constantly spotted together many times in different occasions. They are to tie the knot in a private wedding in Massachusetts soon. well i don't think that the rumors are true. maybe they are together and jim doesn't want to say it in public but i think that these photos don't show anything that we can believe that he's gay. of course rumors are rumors.